Twenty years ago Barry London devised the legendary hundred singletrack miler known as “DeLa”–short for Tour De La Marin. I believe there have been races called the Tour de Marin in the 90’s, maybe earlier. 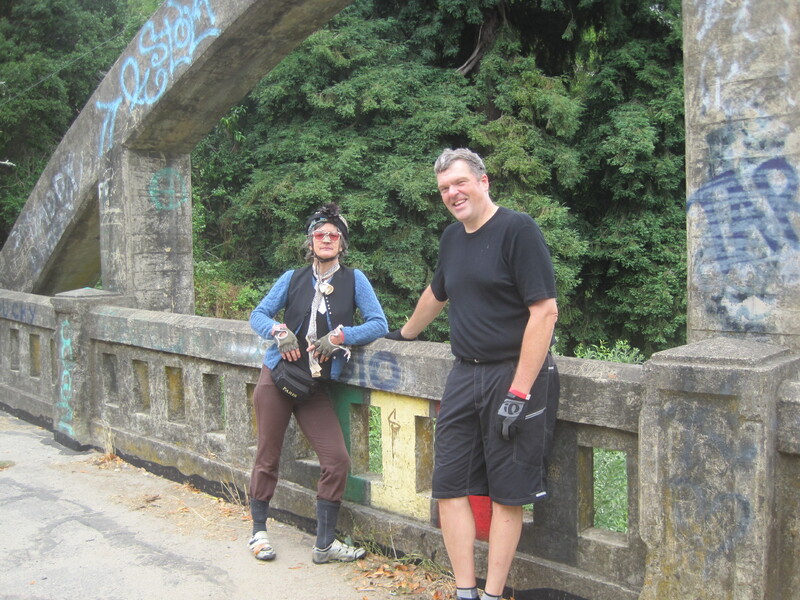 Sunday last, the MCBC inaugurated a mellow 35-40 mile ride from San Rafael to Nicasio and back…the objective: raise lobby-money for the neccessary tunnel (already extant, just needs restoration, modernization) , called the Alto Tunnel, between Corte Madera and Mill Valley. Marin has eleven tunnel bores. All of them should be open to pedestrians and bicyclers. Geoff Halaburt and I opted to do a loop rather than the correct route, in order to actually see Nicasio Reservoir–for me, this is the point of going to Nicasio. There was some fine cheese on offer–Nicasio Creamery now gives the Red & Black cheese factory something to compete with. I liked the washed-rind semisoft tommes created in the Swiss-Italian manner (think talleggio). A lost loner had strayed from the pack of 300, and we dragged him along for the remainder of our loop….George Chang of Vancouver B.C., most likely the furthest travelled. He was visiting his son’s new baby, and scored a rare insider’s tour of the obscure bike path called the Cross-Marin trail. ~ by jacquiephelan on July 27, 2011. I remember when that bridge in the photo was on the main road. I was 4 or 5 or something when my dad took me on drives to West Marin in the old VW Bug. That bridge has always stuck out in my mind. Now, every time I go by it seems more buried in foliage, becoming more obscured like old memories. The Tour de la Marin is a fantasy.Does not exist in print and should not. Thanks, Jacquie. perhaps you never saw my two features in 1998, 1999 i nBIKE? I’d written them with Barry’s blessing. Does the De La Marin still happen?